For the love of organic: food, health, travel, and gear. When I went on the US Post Office's website to look at postage options for our save-the-date postcards, I was let down. 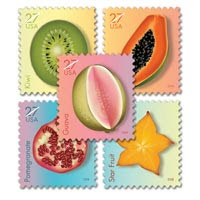 All they had in terms of 27-cent postage was a sheet of tropical fruit stamps. Now, we're getting married at a ranch in Colorado with a subdued color scheme. Tangerine orange, banana yellow, hibiscus pink, and honeydew green with cartoon-y pictures of star fruit and papaya on them doesn't exactly match the mood we're going for. 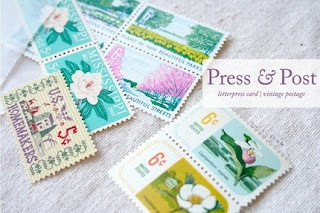 Originally, I wanted vintage stamps. But when I started doing research, they seemed to be quite a bit above and beyond the price of postage. I couldn't justify spending $4.00 on 4 22-cent stamps when they should cost 88 cents. First I checked Champion Stamp, a vintage stamp dealer who comes recommended by Martha Stewart all of the time. As you can guess, they had every stamp imaginable and even had them sorted into a neat little PDF catalog, but they were out of our price range. My stationer, Sarah Parrott, recommended I head to the Sea Jay Stamp and Coin eBay store. Again, his prices were out of budget, but Sarah also had a piece of advice for me: "Jot down the Scott number and then type it into the search. You'll find other sellers with the same stamps at different prices." It worked. 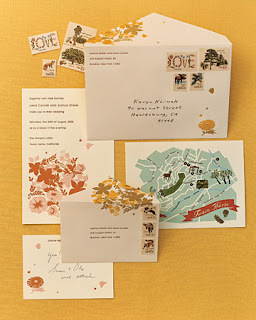 I sifted through Sea Jay's collection, noting the stamps I found most relevant to our invitations: American Horse Breeds, Daniel Boone, Colorado State, National Parks, Sheep, Wooden Ducks, American Folk Art, the list goes on and on. Basically, I was looking for anything outdoorsy, mountainous, farm-like, or Western. Then I typed in their Scott numbers and came up with sellers offering them for face value to well-overpriced. I placed four orders: One sheet of 40 22-cent American Horse Breed stamps, one sheet of 40 6-cent Wolf Trap Farm National Parks Centennial stamps, 15 5-cent red Air Mail stamps, and random assortment of 46 22-cent stamps. 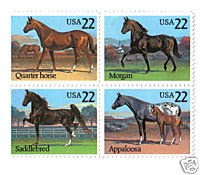 This was more than we needed, but I found a great deal on the American Horse Breed stamps: face value while other sellers had them for as much as $22. And we needed about ten more 22-cent stamps on top of the random assortment anyway. This morning, after my fiance penned the addresses, we started affixing them. Piece of advice #1: Stick the stamps on before you address them. Some of the stamps were too big and started to cover up the addresses. Piece of advice #2: Find out how big the stamps are before you order them. The horse stamps we got (which were our fave) are way too big. They cover up the word "Postcard" a little bit. So, we're going to use up the random assortment of 22-cent stamps and only use a few horse stamps which is the opposite of what we had planned. And the random assortment is definitely, well, random: US Constitution stamps, Christmas stamps, Social Security Act stamps. You get the idea. In the end, some of them look phenomenal, while others look, well, interesting. We'll save most of our horses for our invitations.